Diane Kurasik has seen all the classic films at the Greenwich Village revival theater she runs. Still single in a world of couples, Diane is reminded daily of how her life has not conformed to script. When she receives an eviction notice on the eve of her 40th birthday, her life is upended. In the pursuit of both the elusive apartment and a leading man, she tangles with a likely candidate who doesn’t want the role, and gains an unexpected admirer who doesn’t fit the profile. What would Ingrid Bergman do? read more. 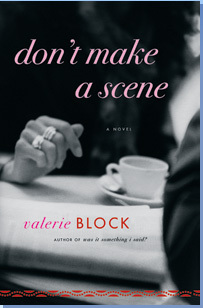 From the living rooms of Park Avenue to the Pastrami King on Queens Boulevard, Valerie Block turns a sharp eye on New York in this sophisticated cocktail of bad manners and criminal behavior. NONE OF YOUR BUSINESS has something for everyone: high-tech embezzlement, petty office politics, emotionally demanding strangers, overworked cops, identity theft and bad attitude. read more. A comic love story about attraction, resistance and the absurdities of finding peace with another human being, WAS IT SOMETHING I SAID? features two unhappily unattached, fairly neurotic New Yorkers who get together under the most dangerous, bizarre and ultimately romantic circumstances. A straight-laced, conservative corporate lawyer with a fixation on “The Sound of Music” meets a wise-cracking marketing executive who needs to make every waiter think he’s a funny guy. It’s not that they’re made for each other, but perhaps they do deserve each other .read more.